Standard Caladiums have large heart-shaped leaves. Height 18” to 22”. All varieties of these standard caladiums grow well in filtered shade or afternoon shade with morning sun. Varieties of caladiums that are tolerant of sun all day are marked with . 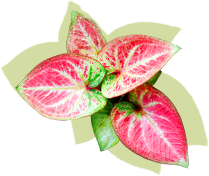 Click on the thumbnail to see larger image and to order the standard leaf caladium variety of your choice.